During the early colonial rule under the East India Company, the Armenian people came to India as traders and established themselves as a visible business community on the Indian soil and they gradually expanded their activities across India where the EIC was operating. After St Thomas, the apostle, the Armenians were instrumental in bringing Christianity to India and in this respect they had good rapport with the English company. The Armenian Church is believed to be the oldest church in Kolkata and was built in Kolkata long before the arrivals of the British in India. 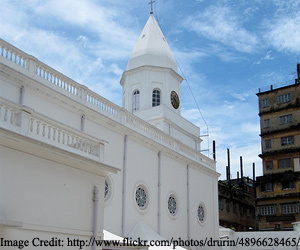 In 1688, EIC build a wooden Church to cater to the christian community there. When Armenians evinced interest in building churches in India, the English cooperated with them and on June 22, 1688, they signed an agreement with the Armenians residing in India. Sir Josiah Child, represented the East India Company; and Khoja Sarhad and Khoja Fanush, represented the Armenian community in Bengal and signed the contract. As per the contract, EIC would build churches across India in places that had a small community of at least 40 Armenians, and allocate a salary of 50 pounds for the priests in those churches. The Armenian Church of Kolkata is tagged as “Mother Church of the Indian Armenians”- the earliest one in this part of India. 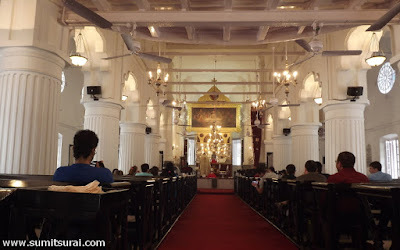 Their churches followed their religious tradition and belief and the Holy Nazareth Church is one of three Armenian churches in Kolkata; the other two being St. Mary’s Church and the church of St. Gregory the Illiminator. 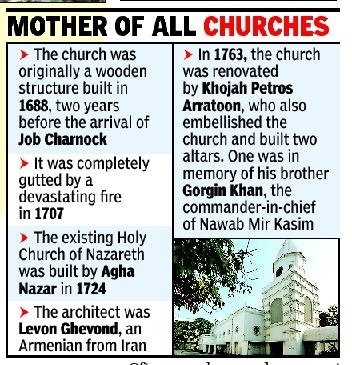 After a fire mishap that destroyed the wooden church built by the British ( now the site of the southeast wing of the Church of Holy Nazareth), a new church was built at the same site by Aga Mamed Hazaar Maliyar, an Armenian in 1734. The attractive interior decoration of the church was done by an Armenian architect named Katchik Arfiel. An interesting feature of the altar in the church is the presence of twelve candlesticks symbolizing Jesus Christ’s Twelve Apostles, besides a Holy Cross and the Gospel text. The architect donated the wonderful church clock. Thanks to the architect who not only donated the Church Clock,but also had a monastery built for the priests of the church and a huge cemetery with high walls on the church premises. 01. With exception, the entire Calcutta Armenian Community, were all descendants of the Armenians of Julfa now in Iran. Very few had connections with Armenia or the Etchmiadzin Apostolic Church. 02. The graveyard at the Armenian Church has Kolkata’s oldest known grave. It was that of an Armenian woman named Rezabeebeh, the wife of the late Sookias buried here in 1630. This tomb, dated July 21, 1630. 03. There is a monument within the compound wall in memory of those Armenians who died during World War 1. 04. The altar of the Armenian Church has well-decorated 3 paintings/ frescoes by English artist A.E Harris, “Holy Trinity”, “Last Supper” and “The Enshrouding of Our Lord”. 05. Besides the Armenian Holy Nazareth church, there are two chapels. 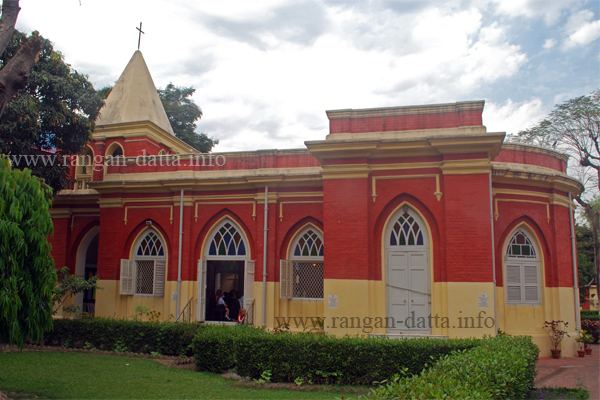 St. Mary's Chapel is in the Tangra area of east Calcutta and the chapel of St. Gregory, (also known to the local Armenians as the 'small church'), is situated in the Park Circus area of Calcutta. 06. There are two chapels. St. Mary's Chapel is situated in the Tangra area of east Calcutta. The chapel of rest of St. Gregory, also known to the local Armenians as the 'small church', is situated in the Park Circus area of Calcutta. 07. Including the Church of St. John at Chinsurah, all the properties. movable and immovable, of the Armenian trusts for Calcutta Armenians are owned and managed by the government through the Official Trustee. 08. In the past century, the church (the main Church at no 2, Armenian St) allowed to hold Russian and Syrian Orthodox Church services. 10. Black and white marble stones adore the interior of the church. 11. Mural tablets dominate the overhead gallery that is accessed by the stairway. 12. In the past the ASI had a row with the management of the oldest church the Armenian Holy Church of Nazareth in Burrabazar, Without informing the government, they destroyed a number of tombstones and memorial plaques to make space available for a driveway and a parking lot. The Archaeological Survey of India (ASI) termed the demolition as 'criminal' since the loss is 'irreparable'. 13. According to ASI regional director Dr P K Mishra, "This is why the tombs are priceless historical documents. Each tomb tells a story of a period. A whole genealogy of Armenians of old Calcutta can be traced here. So the destruction of tombstones and memorial plaques, mostly in marble and iron, is no less than destruction of history," The ASI director visited the church to find out the extent of damage. the extent of damage. The irresponsible attitude of the custodians of the church received wide spread condemnation from the Christan community and heritage lovers.